Start off your visit on the 10th (Wed): tour the pleasant surroundings at Karon Beach, stroll through Patong Beach, and then stroll through Tri Trang Beach. To see more things to do, maps, and other tourist information, you can read our Karon trip planner. Sao Paulo, Brazil to Karon is an approximately 30-hour combination of flight, bus, and taxi. You can also do a combination of bus, flight, and taxi. The time zone difference when traveling from Sao Paulo to Karon is 10 hours. Expect a bit warmer temperatures when traveling from Sao Paulo in July; daily highs in Karon reach 36°C and lows reach 28°C. Finish up your sightseeing early on the 10th (Wed) so you can go by car to Krabi Town. On the 11th (Thu), stop by Scandi Fashion, enjoy the sand and surf at PhraNang Cave Beach, and then kick back and relax at Railay Beach. For photos, where to stay, more things to do, and tourist information, read our Krabi Town day trip planning site . Getting from Karon to Krabi Town by car takes about 3 hours. Other options: do a combination of taxi and bus; or do a combination of taxi and ferry. 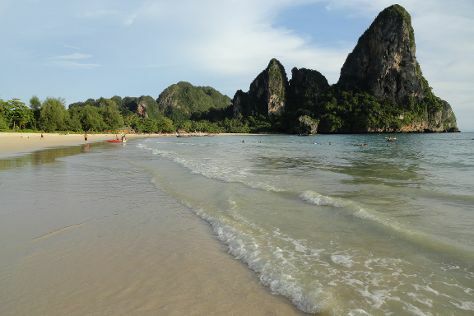 July in Krabi Town sees daily highs of 36°C and lows of 27°C at night. 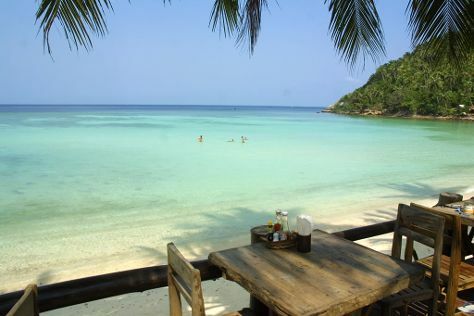 Finish your sightseeing early on the 11th (Thu) so you can travel to Ko Pha Ngan. Your itinerary includes some good beach time at Salad Beach and Haad Khom. Your cultural itinerary includes sights like Chao Mae Kuan Im Shrine and Wat Chaloklum. Next up on the itinerary: enjoy the sand and surf at Thong Nai Pan Noi, experience rural life at Purina Sheep Farm, stroll through Thong Nai Pan Yai Beach, and look for gifts at Sugar & Spice. To find photos, maps, where to stay, and more tourist information, refer to the Ko Pha Ngan holiday builder app . Traveling by combination of bus and flight from Krabi Town to Ko Pha Ngan takes 5 hours. Alternatively, you can do a combination of bus and taxi; or take a bus. Traveling from Krabi Town in July, you can expect nighttime temperatures to be somewhat warmer in Ko Pha Ngan, with lows of 31°C. Finish up your sightseeing early on the 14th (Sun) so you can travel to Bangkok. 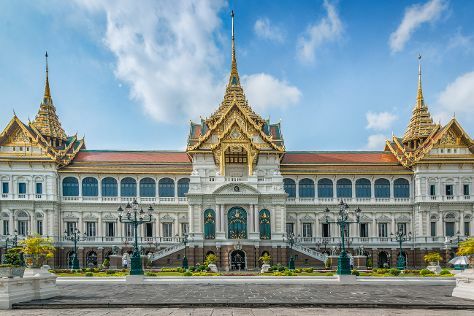 Kick off your visit on the 15th (Mon): step into the grandiose world of The Grand Palace, then take in the spiritual surroundings of Wat Pho, then take in the spiritual surroundings of Temple of Dawn (Wat Arun), and finally contemplate in the serene atmosphere at Wat Saket. Get ready for a full day of sightseeing on the next day: contemplate in the serene atmosphere at Temple of the Emerald Buddha (Wat Phra Kaew), then get engrossed in the history at Baan Kudichin Museum, then explore the world behind art at Bangkok Art & Culture Centre (BACC), and finally admire the striking features of Jim Thompson House. For maps, more things to do, where to stay, and tourist information, refer to the Bangkok trip itinerary app . 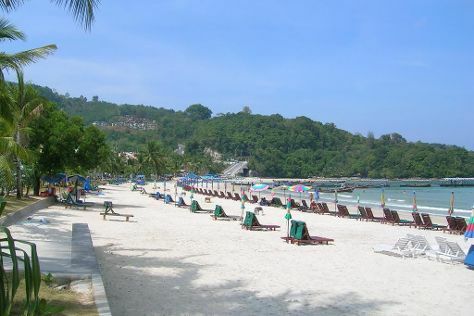 You can do a combination of bus and flight from Ko Pha Ngan to Bangkok in 5 hours. Other options are to take a bus; or do a combination of ferry and train. In July in Bangkok, expect temperatures between 39°C during the day and 30°C at night. Wrap up your sightseeing on the 16th (Tue) to allow time to travel back home.